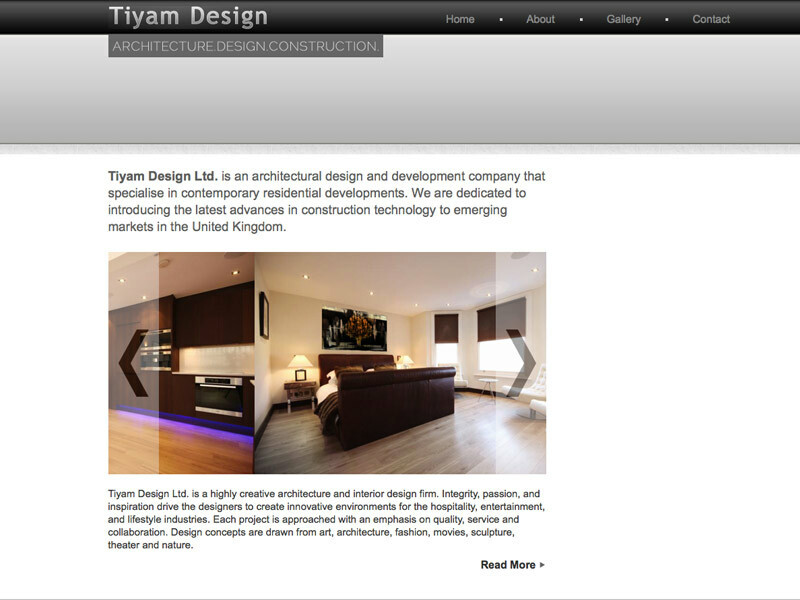 Tiyam architectural design company needed a simple brochure style website for their business. I consulted with them to ascertain their exact requirements, creating a simple static brochure style website including contact form and interactive Google map. Tiyam Design needed a professional website to showcase their services to clients. The website makes use of a jquery fader to create some visual movement and dynamism to the site, image gallery, and a PHP contact form. I also set up and configured the hosting & email. 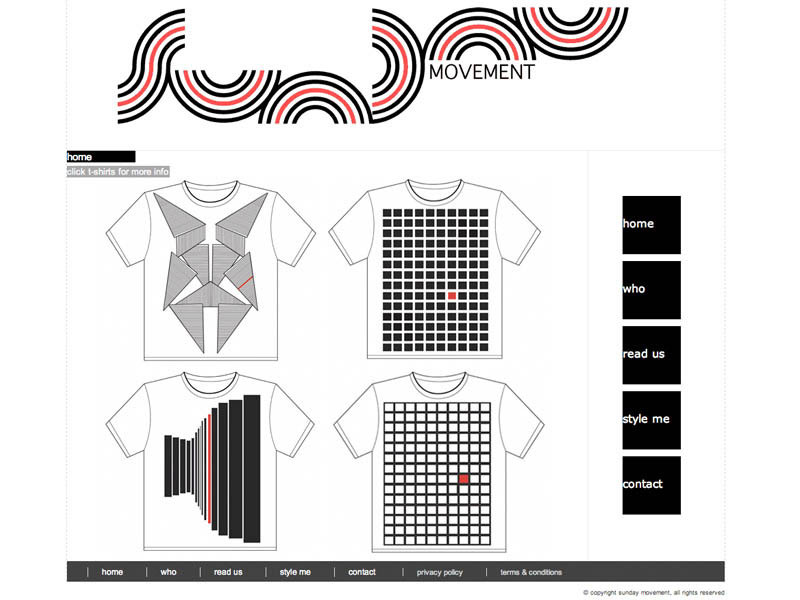 Website design for Steven Wilcox aka Sunday Movement to showcase his screen printed t-shirt designs. The client requested a very clean and minimal design to keep the t-shirt designs the focus. The client had a number of photos he wanted displayed in a novel gallery, for which I made three banks of scrollable photo sliders. Due to high manufacture costs Sunday Movement has since closed commercially, but you can view a copy of the site by clicking the link below. 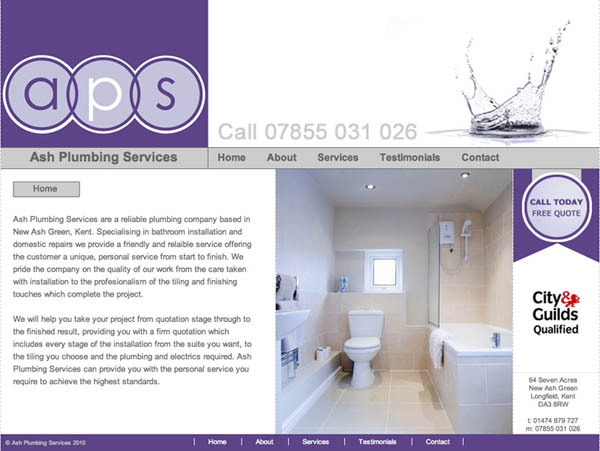 Ash Plumbing Services requested a simple low-no maintenance brochure website to establish an online presence to be co-ordinated with their branding. I created a simple static website using stock images, with emphasis on phone number and contact details. The client requested clean and minimal styling to match the current logo / branding. I recommended the use of stock photos to keep the site bright and fresh. The website makes use of a jquery fader to create some visual movement and dynamism to the site, scrollable Testimonials, and a PHP contact form. I also set up and configured the hosting & email. 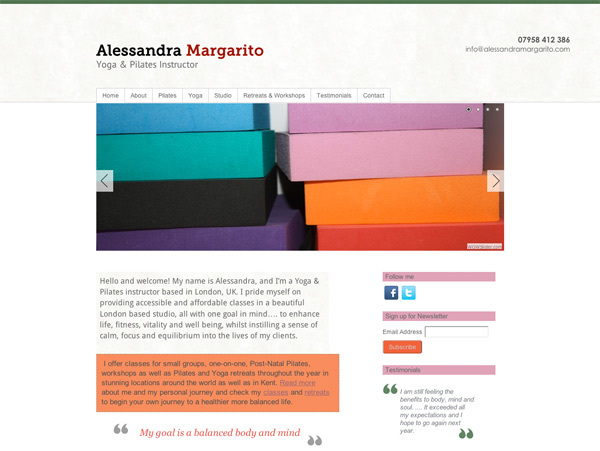 Brochure website for Yoga & Pilates instructor Alessandra Margarito to market her services to new and existing clients. My client needed a website to market herself and help organise her current email list of clients. The site design was to remain simple, clean and effective using the brand colours she had on her business cards and promo material. The site is built in WordPress as CMS – allowing my client to login and make changes to events etc. I took care of the mailing list by setting up and configuring Mailchimp with a subscribe button on the site, and also set-up the clients Facebook page and twitter, matching branding throughout. I was able to advise the client throughout regarding design, usability, and best practice for SEO. Music Video and Website for Story Books band. I was hired for a one day film shoot on location for which I filmed the band performing their promo single. 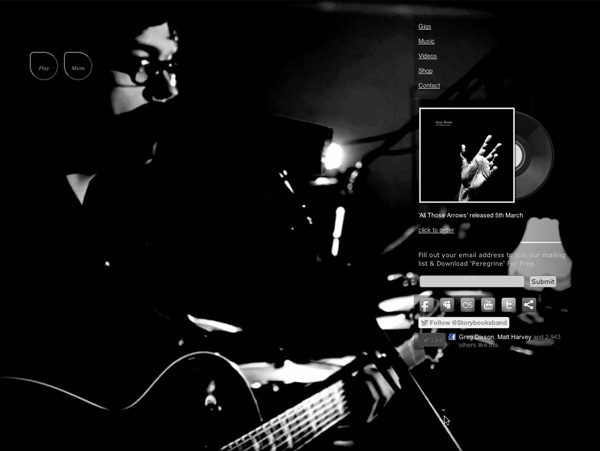 The footage was then used to feature for the website. I worked closely with Story Books band and their label, working on the music video for the single ‘All Those Arrows’. The concept was to capture the band’s energy of their live performance. I acted as cameraman on the day offering input into the creative process. The video was shot in one day in a Kent country house. Once the video was edited I prepared a version to use for the Website for the single promo. The video plays full screen in the background with links to social media, etc. Unsupported browsers fall back to a Flash player alternative. You can view the finished video below.